IDW Publishing (busy, busy people!) 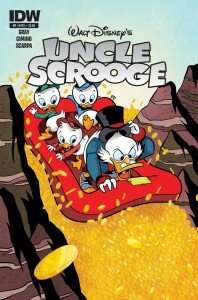 have announced that after publishing the new edition of The Life and Times of Scrooge McDuck by Don Rosa (coming this March) they plan to carry one with a whole new series of Disney character comics — each one beginning with “#1″ from IDW, but actually they are continuations of the classic comics published by Gold Key and others. Only now featuring a slew of new artists and creators from around the world: People like Romano Scarpa, Daan Jippes, Casty, Giorgio Cavazzano, and Al Taliaferro. From the IDW web page: “April sees the debut of Uncle Scrooge #1, which will feature the best tales from creators around the world starring the iconic tycoon adventurer. Donald Duck #1 launches in May, Mickey Mouse #1 in June, and in July, Walt Disney’s Comics and Stories will maintain the original numbering and launch with #721 as the first IDW issue.” Each issue will be available in one of two covers: A regular edition, and a special edition illustrated with a Disney Parks theme (Adventureland for Uncle Scrooge #1, EPCOT Center for Donald Duck #4, and so on through the rest of the year).